EDF Group to install charging point network across Grenoble-Alpes Métropole and maintain it. Grenoble, France, March 4, 2013 – The city of Grenoble, the Grenoble-Alpes Métropole2, car-sharing service operator Cité lib, French energy provider Électricité de France (EDF) and Toyota Motor Corporation (TMC) signed here today a Memorandum of Understanding to begin by the end of 2014 a collaborative zero-emission ultra-compact urban electric vehicle car-sharing project aimed at addressing “last mile” transportation needs for those using public transportation. Nearly 70 ultra-compact urban electric vehicles will be provided for self-service car-sharing within the Grenoble-Alpes Métropole. This project has also received support from the Ville de demain3 fund for the development of Ecocité Grenoble. For Grenoble and the Grenoble-Alpes Métropole, a fully electric car-sharing service has been identified as a solution to meet greenhouse-gas and other air-pollutant reduction targets. The project will provide a solution to meet the demand for “last mile” transportation and complement existing public transportation and car-sharing systems. EDF will install a charging network within the Grenoble-Alpes Métropole with charging points placed at public transportation stations to enable “last mile” transport and in areas where there is minimal public transportation. The project aims to fulfil the objectives of local public authorities to respond to the increasing need for mobility in the Ecocité area, while reducing car use. For TMC, this project is part of research into comprehensive car-sharing schemes to explore the utility and business feasibility of co-modality transport solutions. The main objective of the research is to better understand the interconnection between the different modes of public and individual transportation in an urban environment, as well as to be able to better identify the exact needs of consumers in terms of “last mile” mobility. For EDF Group, this project enables the evaluation for the feasibility of this new mobility system that is linked with charging stations and optimized for new urban traffic service. 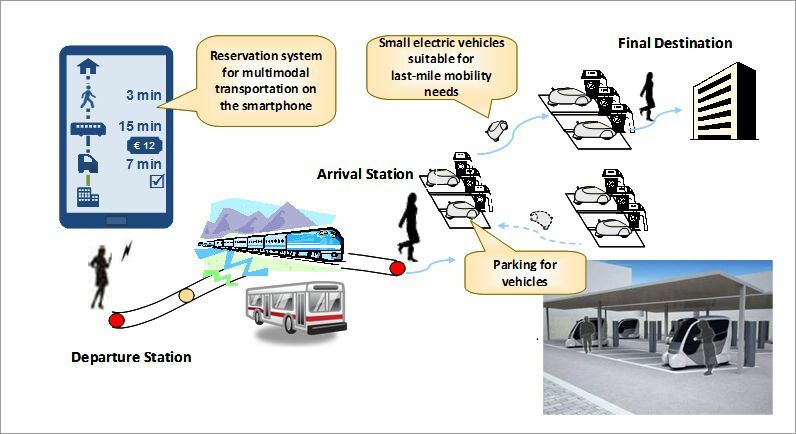 In addition, this project will provide a new IC-card-based personal identification and payment system, linking the charging stations with existing public transportation systems. For Cité lib, this zero-emission urban car-sharing service will complement its current offering of mainly interurban self-service conventional gasoline and diesel car-sharing solutions. The common challenge of the project will be to broaden consumer understanding and acceptance of car-sharing systems in preparation for its wider use the future. TMC plans to supply nearly 70 ultra-compact electric vehicles, including the COMS ultra-compact vehicle produced by Toyota Auto Body, as well as a new vehicle based on the Toyota i-ROAD concept vehicle to be unveiled tomorrow at the Geneva Motor Show. These vehicles, with their compact dimensions, have been adapted specifically for urban driving, efficient use of parking spaces, and for “last mile” mobility needs. TMC will also provide the One-Mile Mobility Management System, a unique centralized IT management system that will enable users to check location and availability of car-sharing vehicles and book them through smartphones. The system will also allow the fleet operator to optimise vehicle allocation throughout the charging station network. For this project, EDF Group will set up a network of charging stations and introduce a system to manage their location information and availability. EDF Group will also provide knowledge about charging infrastructure and EV car-sharing, enhancing product and service for last-mile mobility. Cité lib, which operates a car-sharing business in Grenoble, will handle daily operations and customer service. They will be in charge of responding to customer inquiries, subscription management, reservations and maintenance of vehicles and charging stations. They will also optimise vehicle availability throughout the charging station network. 1A French governmental program supporting innovative urban projects such as sustainable urban development, introduction of alternative energy, and new traffic transportation systems. At this moment, 93 programs (in 13 cities) are recognized as “Ecocité”. In Grenoble, a program in the northwest of the city is recognized. 3A program supporting projects for new urban models such as innovative public transportation, alternative energy and new lifestyle approaches. The program is funded by a private investment group foundation, le group Caisse des Dépôts.